The new Alphacool NexXxos radiators, a name that stands for experience and quality has come to bring a fresh breeze to the radiator market. Every user of a water cooling system needs a radiator and everyone has different requirements towards the heat exchanger. Of course the customer always demands the best in its class. The Alphacool NexXxos radiators have come to compete with and to beat the best in their class and to be the best radiator in all sizes. No more endless choices without a clear class leader, the Alphacool NexXxos is the one tool for all your needs! Alphacool has been the company to introduce new developments and improvements in the radiator and water cooling sector generally many times over the last years. Following this tradition, the new NexXxos radiators are the first to truly deserve the “Full copper” attribute. All main parts, not only the fins and channels, but the chambers are also made from copper. This brings an improvement in performance where other radiators are left without a chance. The material already gives an advantage over the competition and the inner structure is up to par with the competition. Separated chambers give the coolant a clear direction, allowing high flow rates which improve the performance of the whole cooling loop. Flat chambers on the heat exchanger increase mounting flexibility thanks to the reduced overall length. Versatile and easy mounting is one of the main points, on which the research and development department at Alphacool focused. The chamber offers three possibilities for fitting installation on both inlet and outlet (not on the NexXos ST30). Less angled fittings are needed, improving flow rates and offering more mounting possibilities. Hence the radiator can even be installed in tight enclosures, where otherwise internal installation is not a possibility. A 1/4" screw plug allows easy de-aeration of the radiator (on all UT60 and NexXxos Monsta) and hassle-free vertical installation of the heat exchanger. The threaded opening can even be used for filling, e.g. in combination with a Fillport. Versatility is the essence of the new NexXxos series! The radiators are available in different versions to be used with 120mm, 140mm or 180mm fans and are available in different thicknesses. The choice of 30mm, 45mm and 60mm offers the perfect radiator for every purpose. Even mounting and installation of fans and radiator grills is easy and versatile with these radiators: The M3 threads are standard in the radiator sector and available in all lengths at an affordable price. Even the dreaded insertion of a screw too far into the radiator does not result in expensive damage. Unlike other radiators, the NexXxos series is equipped with an internal protective ledge which stops the screw before it damages the fins. Fin spacing is always an important factor in radiator design. The new series from Alphacool has a fin design which allows it to perform extremely well even with slow-spinning and medium-speed fans. This is not only pleasant thanks to the fact that it avoids unnecessary noise; it also means that the choice of fans that can be used with these radiators is not restricted. These radiators are the result of experience and powerful performance meeting future-oriented design and well-thought through solutions. 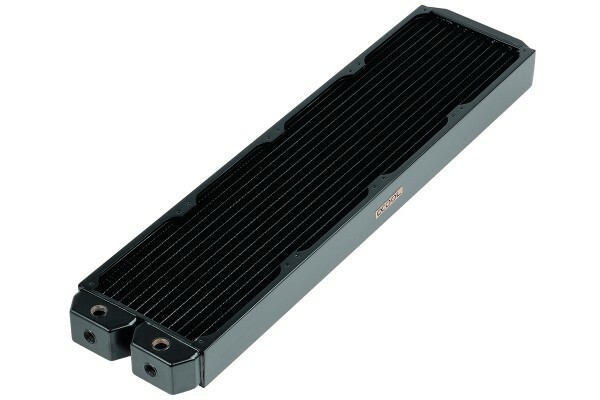 Alphacool NexXxos radiators: The one tool for all your cooling needs!